© 2002, © 2018 by Paul Freeman. Revised 4/27/18. Nottingham Field, as depicted on the 1940 Washington Sectional Chart. The date of construction of this small early airport has not been determined. The Airway Beacon was depicted in the same fashion on the 1935 Washington Sectional Chart. The earliest depiction which has been located of Nottingham Field was on the 1940 Washington Sectional Chart. It depicted Nottingham as a commercial/municipal airport. was temporarily located at Nottingham Field VA supporting exercises going on at the A.P. Hill Military Reservation. 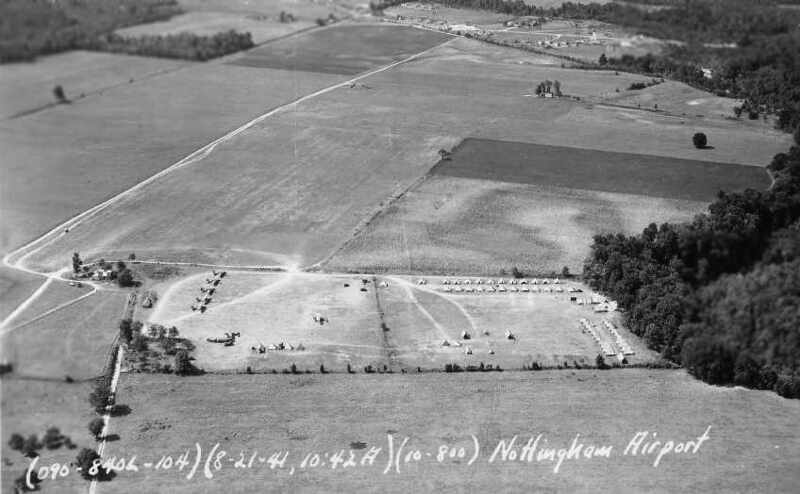 An 8/21/41 aerial photo by Frank Matricciani of the “Nottingham Airport” (courtesy of Carmel Matricciani). It showed a large open grass field, on the side of which were a tent encampment, along with 7 single-engine aircraft. An 8/21/41 aerial photo by Frank Matricciani of 7 unidentified aircraft & an encampment at the “Nottingham Airport” (courtesy of Carmel Matricciani). 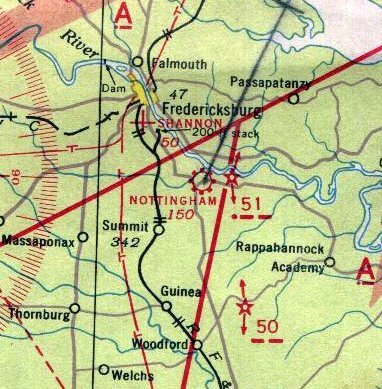 The last aeronautical chart depiction which has been located of Nottingham Field was on the November 1941 Washington Sectional Chart (courtesy of Ron Plante). 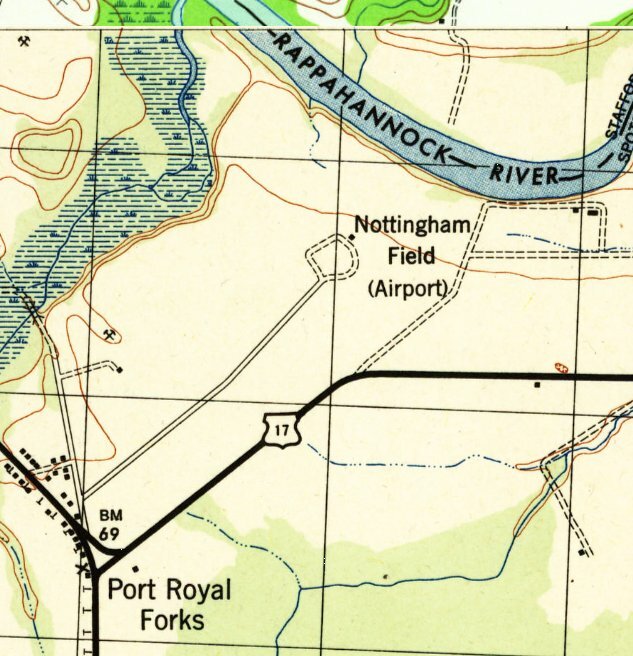 The most detailed depiction which has been located of Nottingham Field was on the 1942 USGS topo map (courtesy of Steve Bennett). 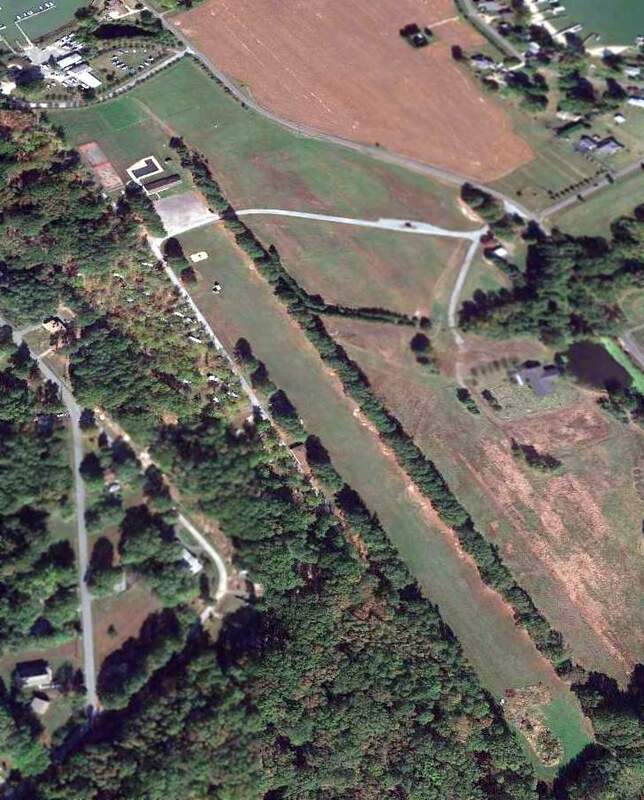 It depicted “Nottingham Field (Airport)” along the southwest shore of the Rappahannock River, having a single small building along a circular driveway, but it did not depict any other airfield features. Nottingham Field was evidently closed at some point between 1941-42, as it was no longer depicted on the May 1942 Washington Sectional Chart (courtesy of Ron Plante). 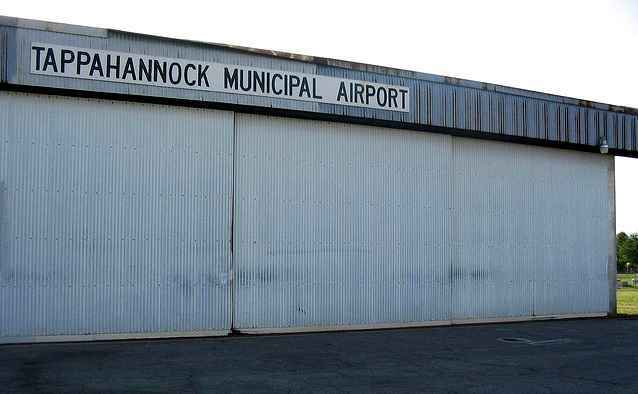 Its closure was presumably due to the wartime restrictions on small civilian airports near the coasts. with a single small building along a circular driveway, and an open grass field. But it did not depict any signs of recent aviation use. but the site was otherwise unrecognizable as a former airfield. The site of Nottingham Field is located northwest of Nottingham Drive, appropriately enough. Thanks to Steve Bennett for pointing out this airfield. 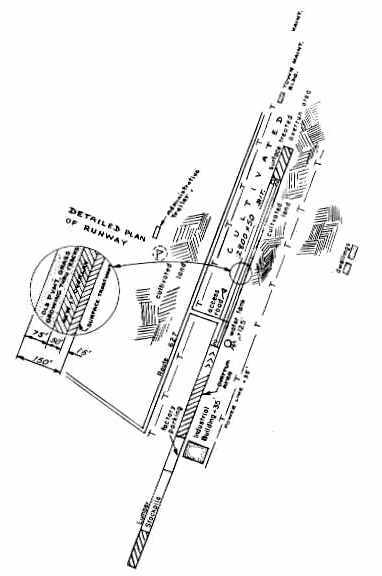 The original location of Shannon Field, as depicted on the 7/10/29 Commerce Department Airway Bulletin. Photo of of the airport while in use has not been located. The original location for this small general aviation airport was located a half-mile northwest of its eventual location. According to the current Shannon Field website, Sidney Shannon learned to fly in 1927 at Hoover Field, across the river from Washington DC. He opened the first Shannon Field in the 1920s. The earliest depiction which has been located of Shannon Field was a 7/10/29 Commerce Department Airway Bulletin. It described Shannon Field as a 60 acre irregularly-shaped sod field measuring 1,850' north/south. Three hangars were depicted on the east side, and the owner & operator were listed as S.L. Shannon. 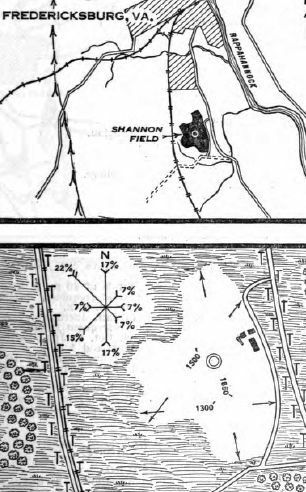 The earliest aeronautical chart depiction which has been located of Shannon Field was on a 1930 Air Navigation Map. The 1935 Washington Sectional Chart depiction Shannon Field as a commercial/municipal airport. 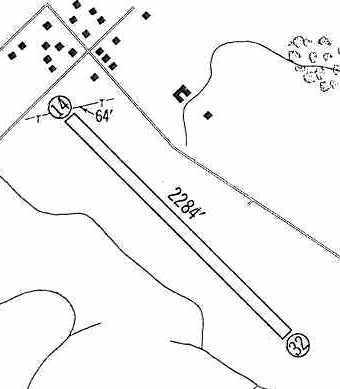 The 1935 Air Pilot's Register (courtesy of Paul McMillan) described Shannon Field as a municipal airport having 3 sod runways, with the longest being 2,000' north/south. Three small buildings were depicted on the east side. 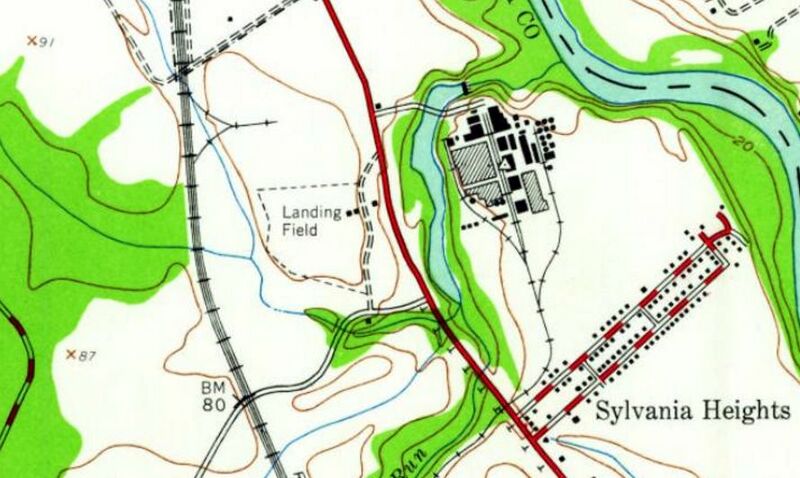 The original location of Shannon Field as depicted on the 1948 USGS topo map. 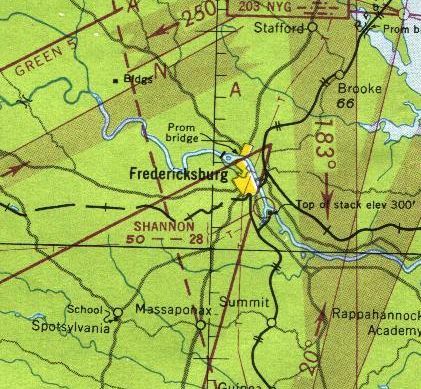 The last aeronautical chart which depicted the original location of Shannon Field was the 1949 Washington Sectional Chart. It depicted Shannon Field as having a 2,800' unpaved runway. 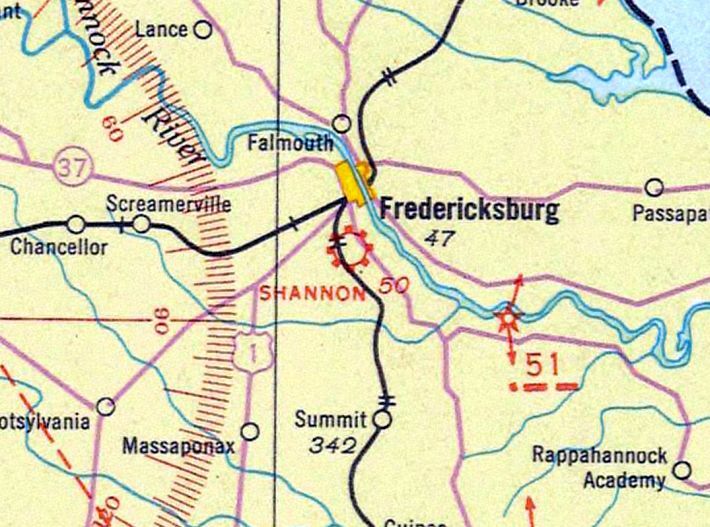 as the 1951 Washington Sectional Chart depicted Shannon as having been relocated to its eventual location, a half-mile further southeast. 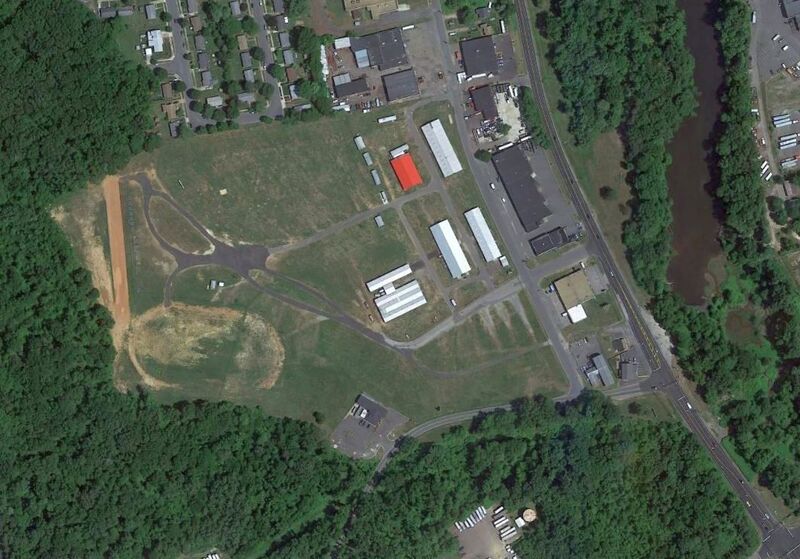 with possibly a runway outline still recognizable along the north side of the property. 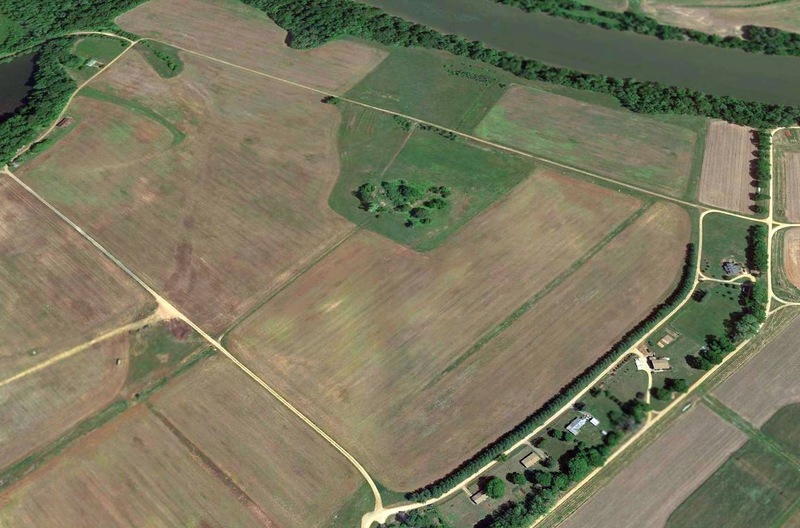 A 2015 aerial view showed no trace remaining of the original Shannon Field. The site of the original Shannon Field is located west of the intersection of Oldfield Street & Airport Avenue, appropriately enough. 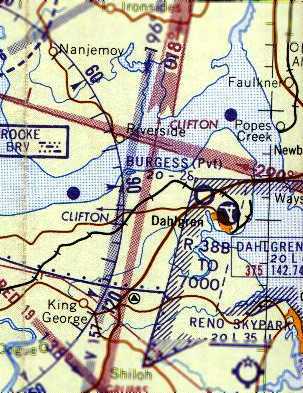 The earliest depiction which has been located of Burgess Airfield was on the 1947 Washington Sectional Chart. 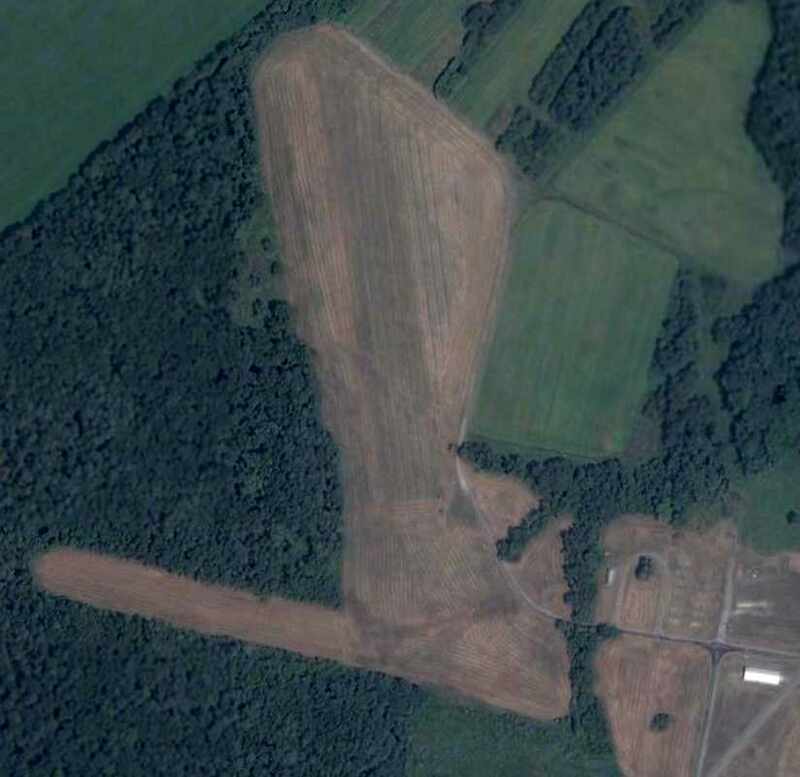 This private airfield was located directly across Route 301 from the Navy's Dahlgren airfield. According to Sean Gates, “I talked with Peggy Mullen, the daughter of Blue Burgess. Peggy tells me that Burgess Field, the one that became Bayberry Estates, actually was the 2nd location. Sean continued, “Roland Burgess & his wife Viola purchased that land from the Peed family in August of 1941. Prior to Peed ownership, it was part of the Cloverdale Estate. 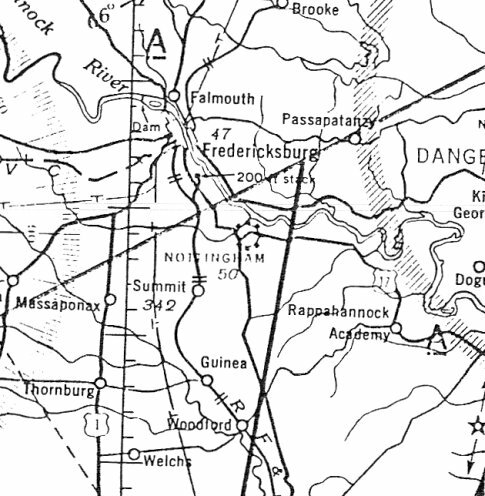 Burgess Airfield was not yet depicted on the 1946 USGS topo map nor on the October 1946 Washington Sectional Chart (courtesy of Ron Plante). which depicted Burgess as having a 2,800' unpaved runway. 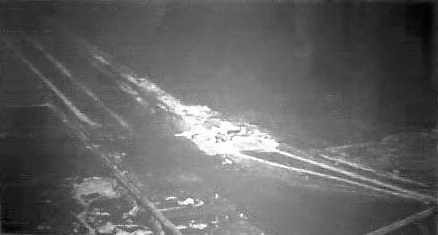 The only photo which has been located showing Burgess Airfield in operation was a 3/27/52 aerial view. with 4 single-engine aircraft & a few small buildings at the south end of the field. 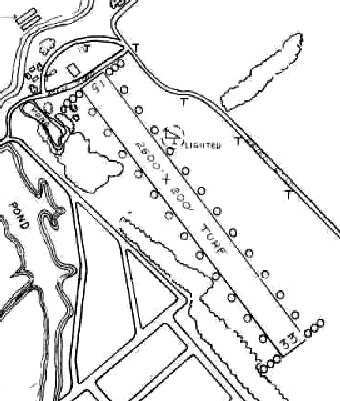 The most detailed depiction which has been located of Burgess Airfield was on the 1955 USGS topo map (courtesy of Clifton Huston). 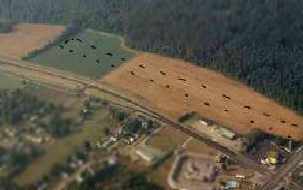 It depicted Burgess as having 2 perpendicular unpaved runways, on the northwest side of Route 301.
but it is not known if these buildings were airfield-related. According to Sean Gates, “In August 1956, Mr. Burgess passed away, and left the land to his widow & their grown children. 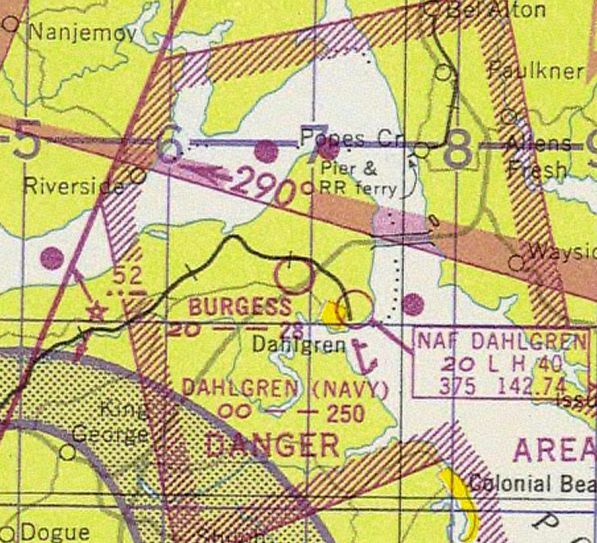 The last depiction which has been located of Burgess Airfield was on the 1960 Washington Sectional Chart (courtesy of Mike Keefe). It depicted Burgess as a private field having a 2,600' unpaved runway. According to Sean Gates, “In October 1961 Viola Burgess passed away. By this time the land was already under development for what was then known as the Cloverdale Subdivision. 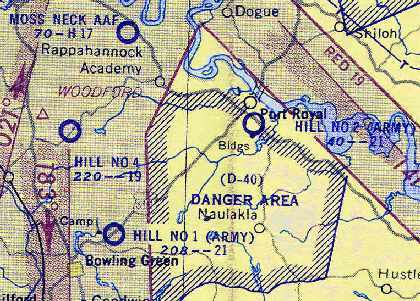 Burgess Airfield was no longer depicted on the 1964 Washington Sectional Chart. but the majority of the northeast/southwest runway remained clear. but instead showed that the southeastern end of the former southeast/northwest runway had become a street (Danube Drive) lined with homes. According to Sean Gates, “At least one of those 2 little buildings near the road was a gas station that the Burgesses owned. At some later date it was replaced with a modern cinderblock building, which still stands [as of 2017], but the original structure would likely have been a wooden one. The other building is probably a building my friends & I explored once in the 1980s, when it still stood behind the current gas station building. It was a garage, kind of like a small barn, green with a tin gambrel roof, and there was an old Dodge Brothers sedan from the 1920s inside of it, and what looked like spare airplane parts. showed that the northeast/southwest runway had also become a street (Delaware Drive) lined with homes. 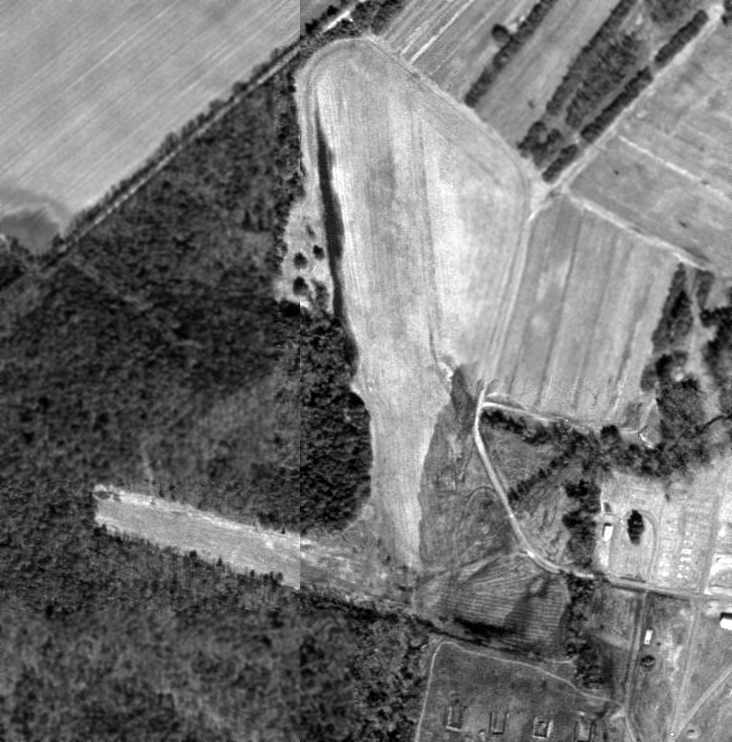 A 2002 aerial view showed no remaining recognizable trace of Burgess Airfield. 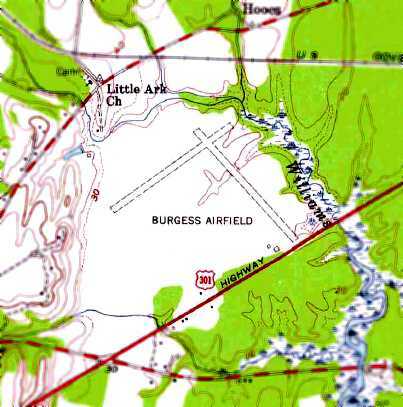 The site of Burgess Airfield is located northwest of the intersection of Route 301 & Danube Drive. 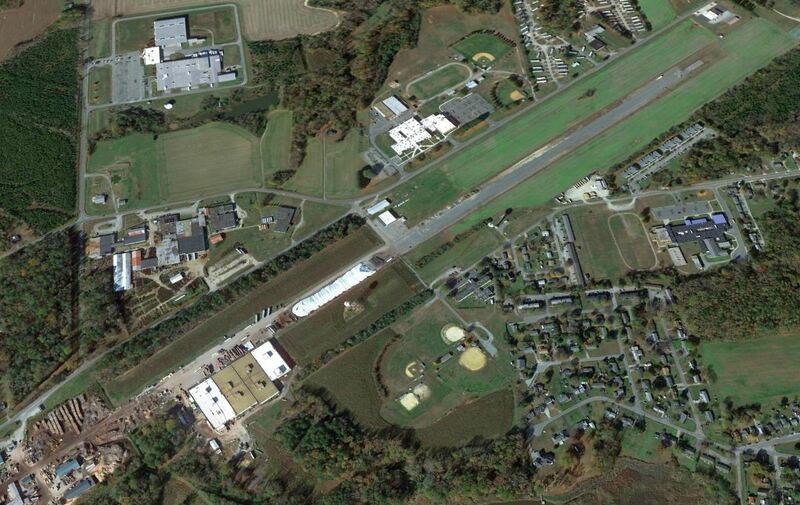 Thanks to Clifton Huston for pointing out this airfield. 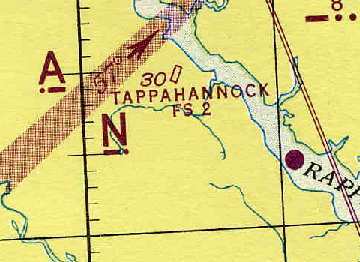 The Tappahannock Flight Strip, as depicted on the 1944 Regional Aeronautical Chart (courtesy of Chris Kennedy). which were intended to be used as emergency airfield by military aircraft. nor the 1944 USGS topo map. which described the "Tappahannock Flight Strip, Army"
as having a 4,000' hard-surfaced runway, with a total landing distance of 8,000' available. from the 1945 AAF Airfield Directory (courtesy of Scott Murdock) depicted the field as having a single asphalt runway. The 1945 AAF Airfield Directory (courtesy of Scott Murdock) described Tappahannock Flight Strip as “Inactive”. 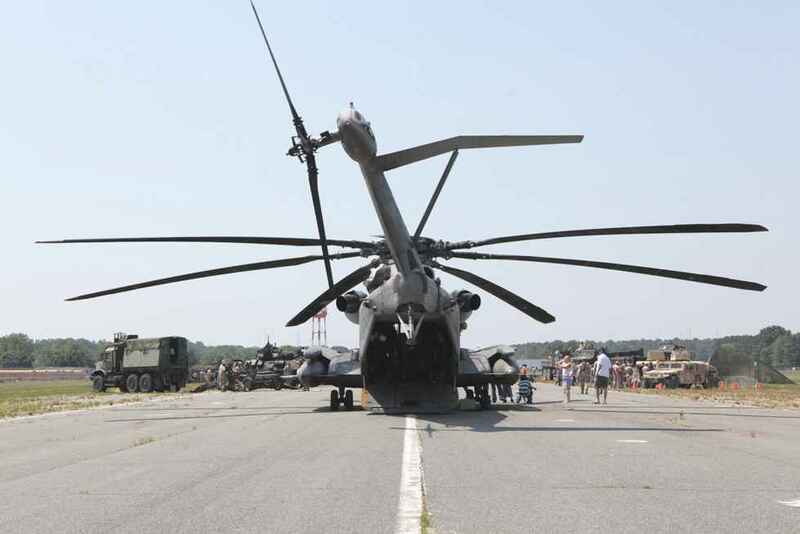 The field was said to consist of a single 4,000' asphalt NNE/SSW runway, and to not have any hangars. 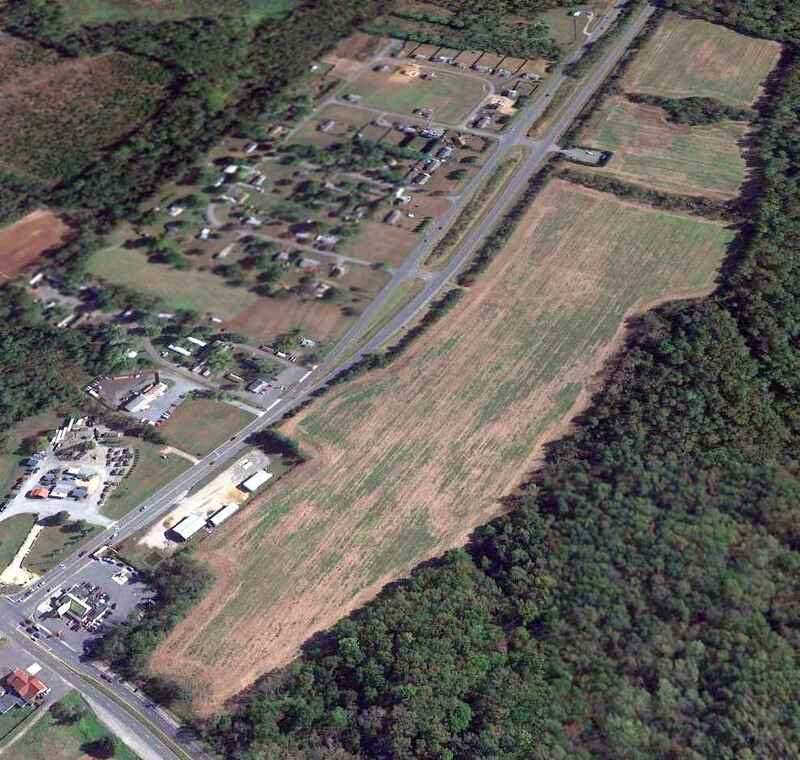 The field was described as being owned & operated by the VA State Highway Department. 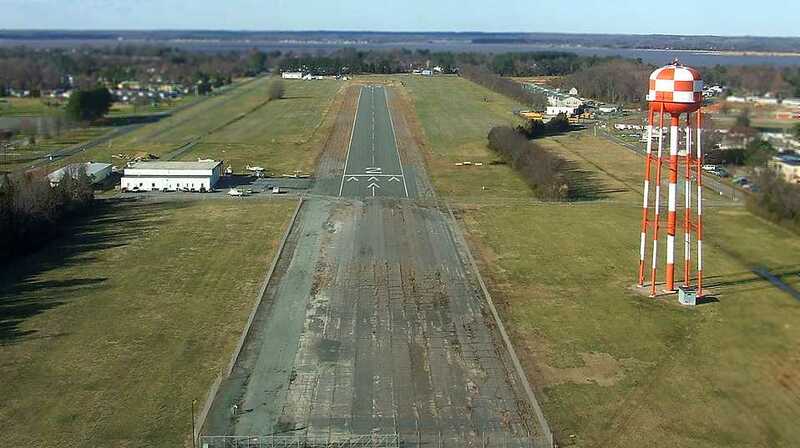 At some point between 1945-53, the Tapphannock Flight Strip was reused as a civil airport. 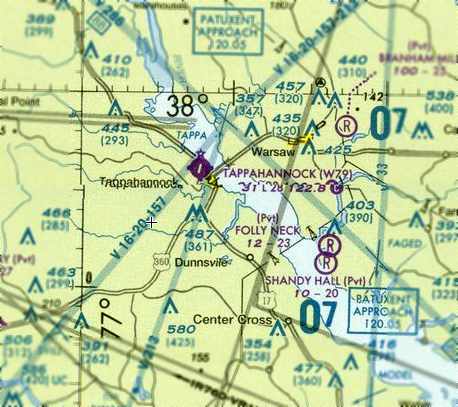 depicted "Tappahannock FS" as having a 5,000' hard-surface runway. The 1961 USGS topo map depicted a single paved 6,100' northeast/southwest runway, labeled simply as “Landing strip”. as a displaced threshold had been applied to the southern end. 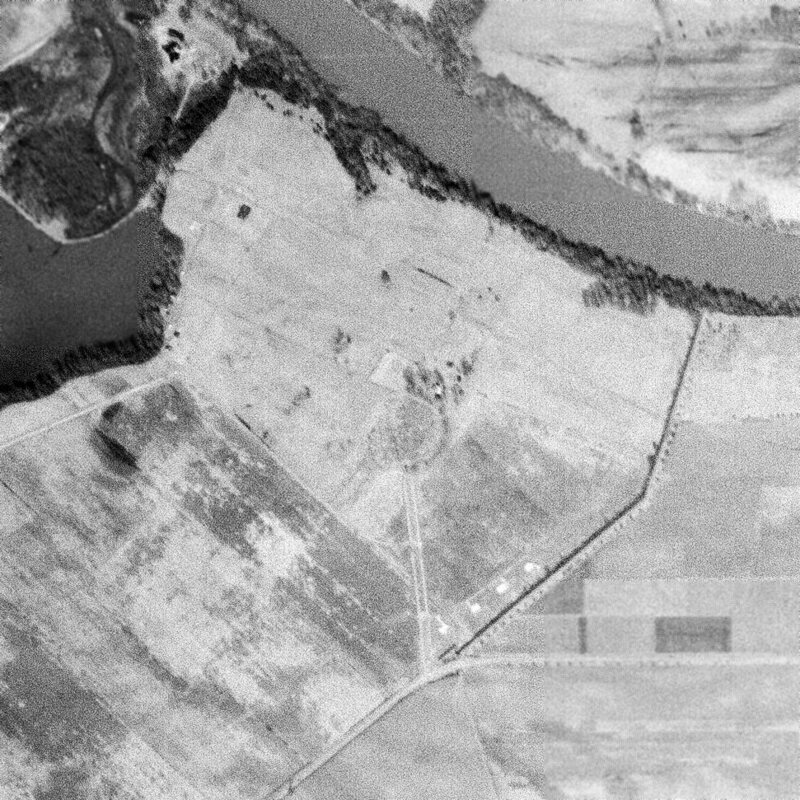 A 1/13/67 USGS aerial photo showed only a single light aircraft visible on the field. 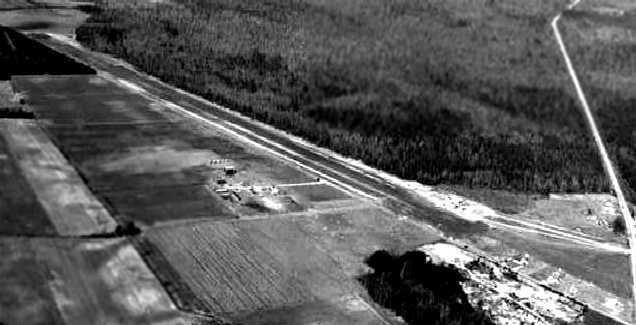 A factory had been built adjacent to the southeast side of the runway at some point between 1945-67.
with a 50' width having been newly paved, over an original 150' width of “old pavement grass growing through cracks”. but there were no hangars depicted. The operator was listed as the Town of Tappahannock, with the manager listed as G.C. Clanton. as well as the water tower. according to a historical account displayed in 2008 in the new Tappahannock Essex County Airport. Improvements included a hangar & terminal building. and a factory having been built adjacent to the southeast end. and the airport went into a period of decline. 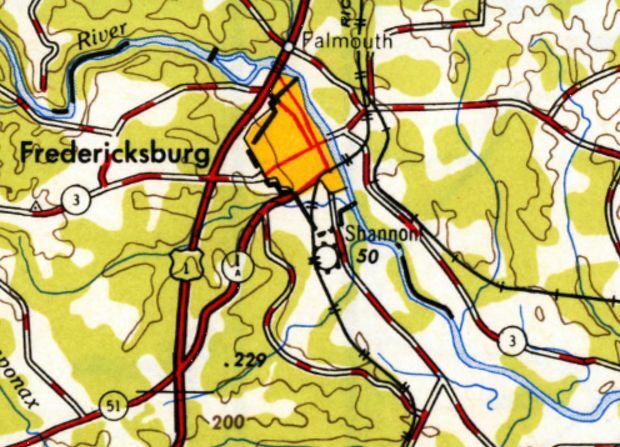 The 1980 USGS topo map labeled the site as Tappahannock Municipal Airport. The 1982 AOPA Airport Directory (courtesy of Ed Drury) listed the field's operator as Essex Aviation Inc.
from the International Flying Farmers Magazine (courtesy of Kenneth Keeton). showed a total of 8 light aircraft parked on the ramp on the west side of the field. with an administration building & main hangar on the west side (which had evidently been added at some point between 1969-98). A circa 1990s photo showing several Cessnas at Tappahannock. 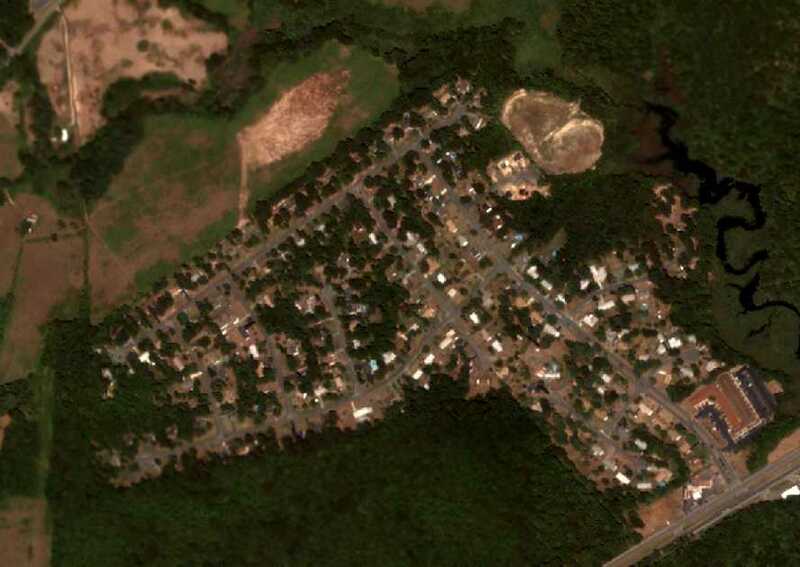 A circa 1990s aerial view looking north at Tappahannock. Paul Freeman flew a Diamond Katana DA-20 into Tappahannock in 1999.
a large factory sat directly adjacent to the southeast side of the runway. & was used as a parking lot for the factory. 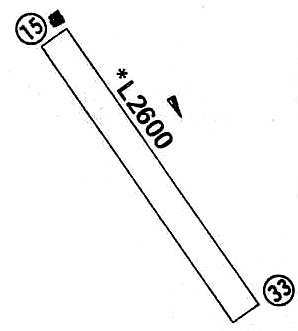 reducing the length of the maintained runway to only 2,785'. 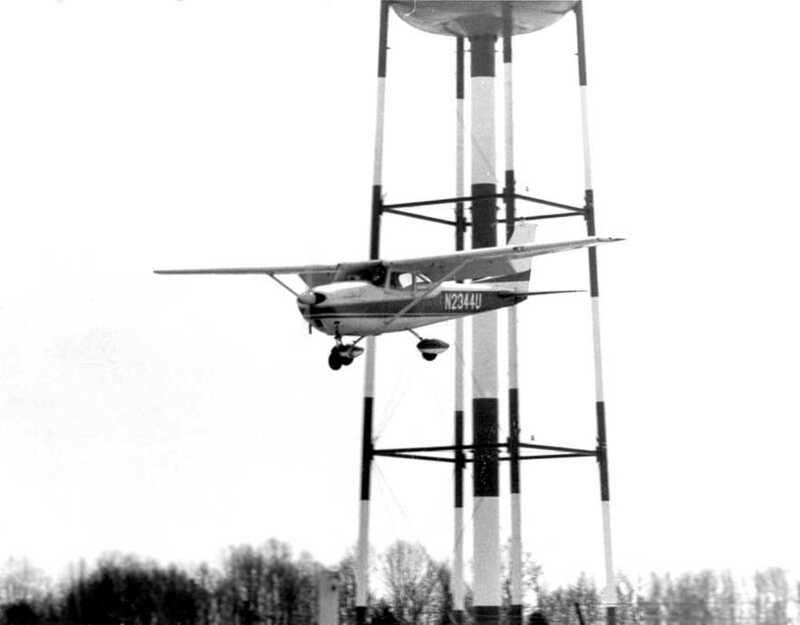 Plus, a tall water tower sat very close to the runway, just north of the factory. (even with the significantly displaced threshold). 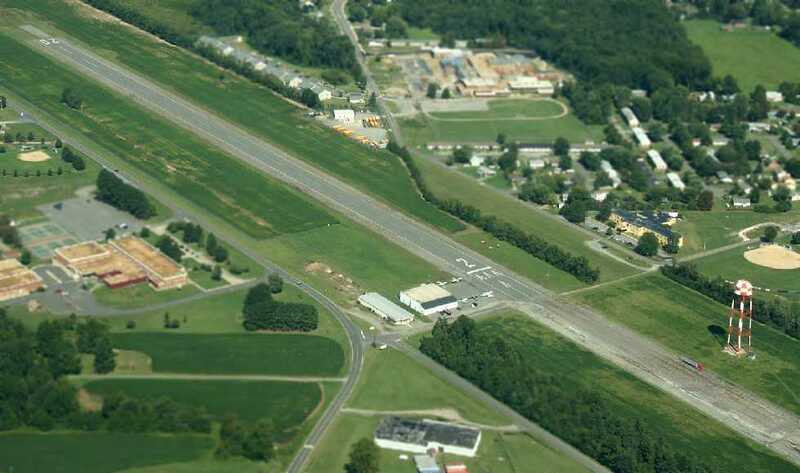 with a newly constructed Tappahannock Essex Airport at Paul's Crossroads (3 miles to the southwest). and the property would be redeveloped as an industrial park. 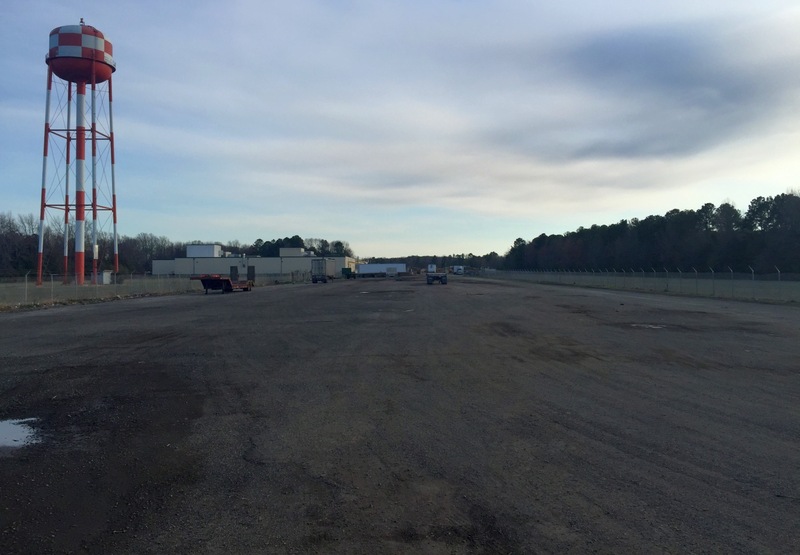 "Essex county began the land acquisition at Paul's Crossroads for the new airport in 1999." A 5/13/05 photo of a hangar at Tappahannock Municipal Airport. until it closed in 2005, according to an article in the 1/5/07 issue of the Richmond Times-Dispatch. A July 2006 aerial view by Alex McMahon looking west at the old Tappahannock Airport. with the manager listed as Linwood Wadsworth. and it was said to host a total of 581 takeoffs or landings per month. A 3/18/07 aerial view by Peter Palafoutas, taken on final approach for Runway 2. Three single-engine aircraft were visible near the hangar on the west ramp. was on the August 2007 Washington Sectional Chart. 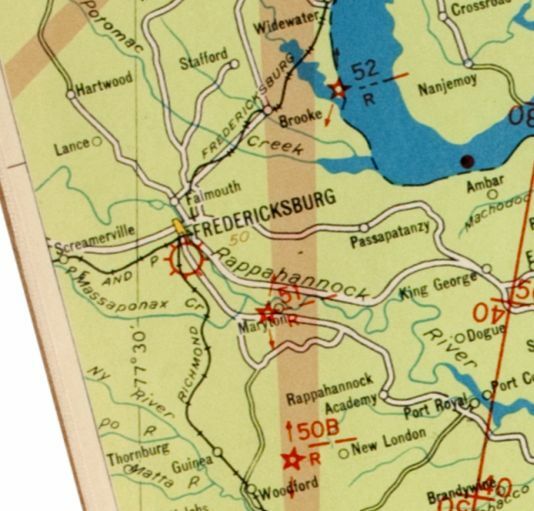 It depicted Tappahannock as having a single 2,800' paved runway. with a 4,300' paved runway with clear approaches (a considerable improvement over the old airport). 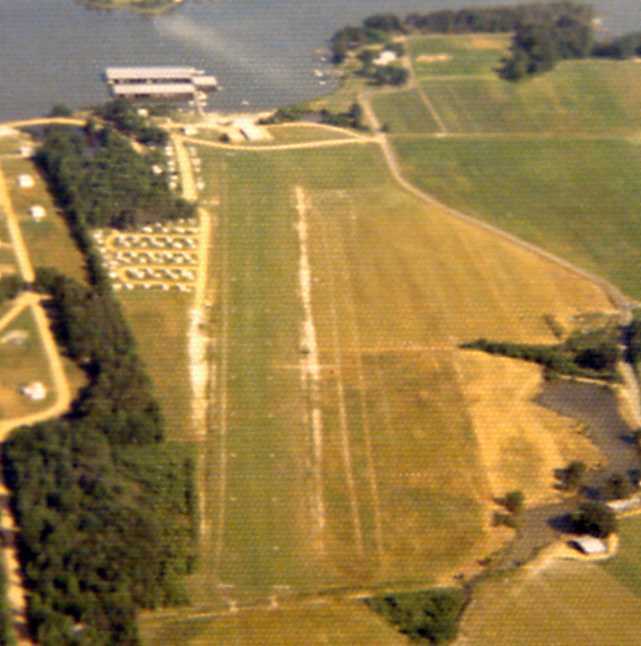 The last photo which has been located showing based aircraft at the original Tappahannock Airport was a 9/15/07 aerial view by Seth Cassaday looking northeast. A 9/15/07 aerial view by Seth Cassaday looking east at the planes on the Tappahannock Airport ramp. for their patriotic support & hospitality during Realistic Urban Training at nearby Fort A.P. Hill. 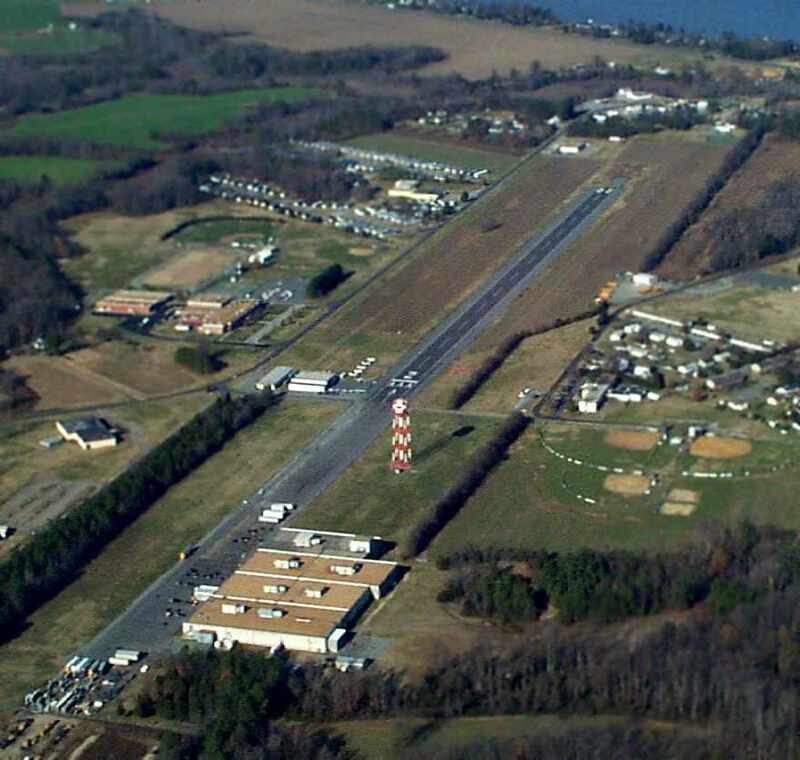 A 2015 aerial view looking northwest shows the original Tappahannock Municipal Airport to remain intact. A 3/15/17 photo by Paul Freeman looking northwest at the hangar at the original Tappahannock Municipal Airport. A 3/15/17 photo by Paul Freeman looking northeast along the former runway at the original Tappahannock Municipal Airport. 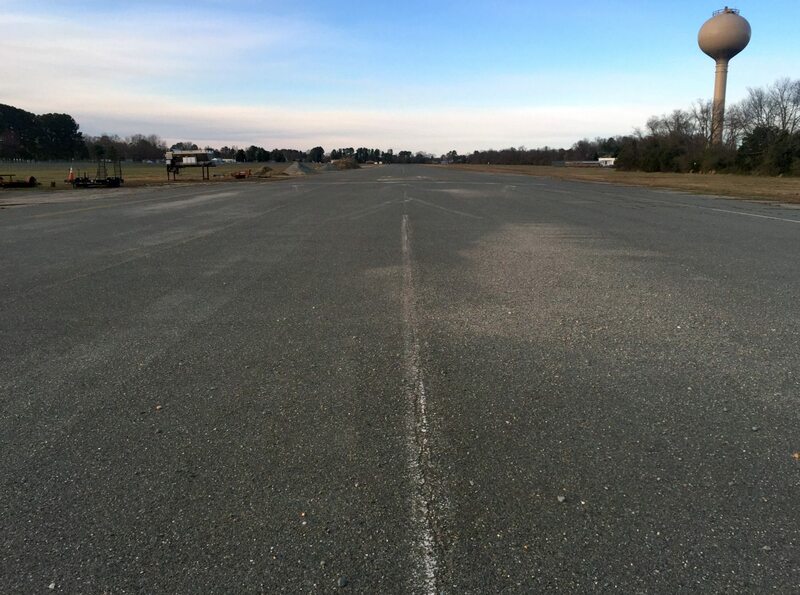 A 3/15/17 photo by Paul Freeman looking southeast along the former runway at the original Tappahannock Municipal Airport. 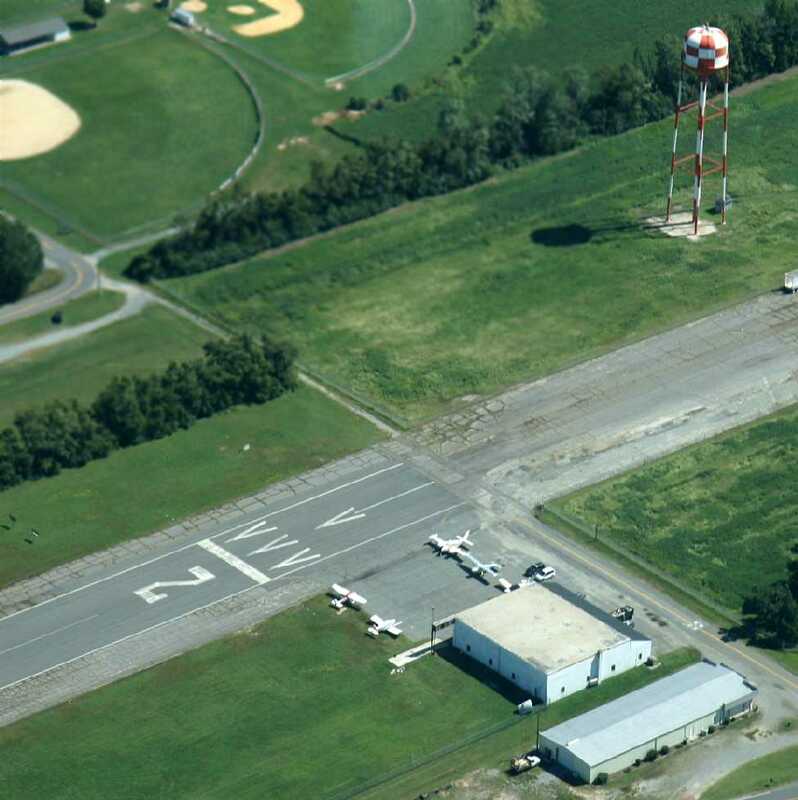 The original Tappahannock Municipal Airport is located south of the intersection of Route 17 & Airport Road. 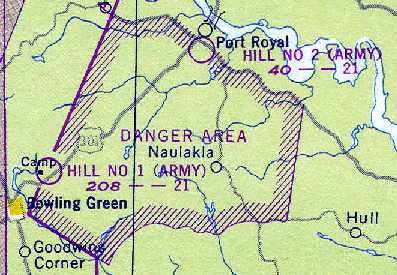 "Hill #2 (Army)" Airfield, as depicted on the October 1948 Washington Sectional Chart (courtesy of Chris Kennedy). 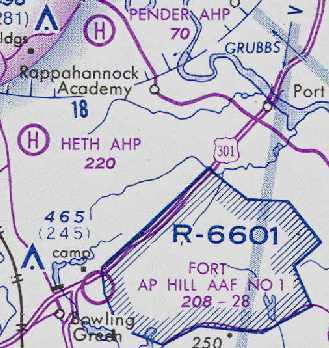 The 76,000-acre Fort A. P. Hill was established as an Army training facility on 6/11/41. During World War II, the Fort operated as a training site for corps & division-sized units. nor the April 1947 Washington Sectional Chart (according to Chris Kennedy). was on the October 1948 Washington Sectional Chart (courtesy of Chris Kennedy). 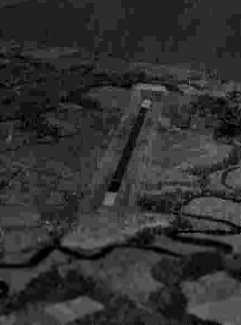 It depicted "Hill #2 (Army)" Airfield as having a 2,100' unpaved runway. bisected by an unpaved road. as that is how it was listed in the 1960 Jeppesen Airway Manual (courtesy of Chris Kennedy). The field was depicted as consisting of a single 2,284' unpaved Runway 14/32. which was described as being unattended. on the February 1962 Washington Sectional Chart (according to Chris Kennedy). 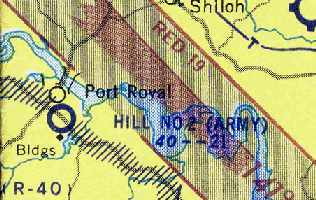 Port Royal AAF #2 (and the other 3 Camp AP Hill Army Airfields), as depicted on the 1963 USGS topo map. 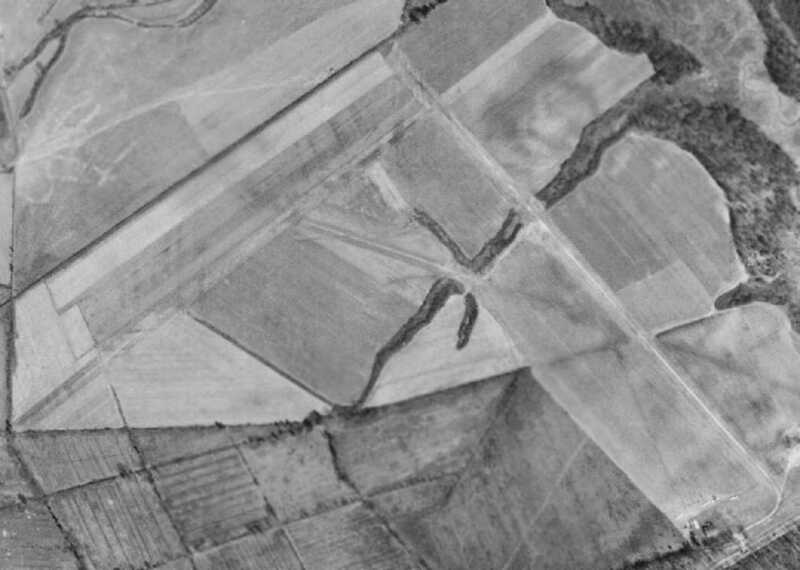 A 1967 aerial view depicted the airfield site as an open grass field. 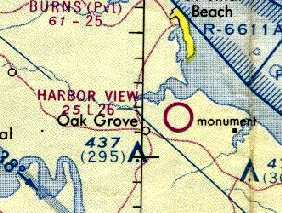 The 1971 USGS topo map no longer depicted the airfield. which was evidently also known as “Nottingham Field”. and not a trace remained of the former runway. A 10/25/13 aerial view looking east showed no trace remaining of Port Royal AAF. 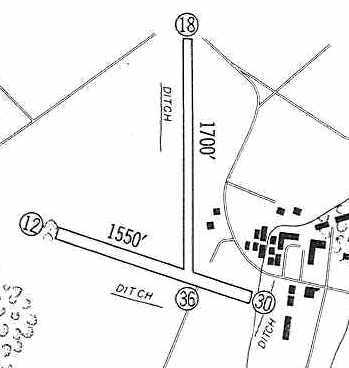 The site of Port Royal AAF is located south of the intersection of Route 301 & Route 17. "Moss Neck AAF", as depicted on the January 1954 Washington Sectional Chart (courtesy of Chris Kennedy). as it was not yet depicted on the 1944 USGS topo map nor the October 1948 Washington Sectional Chart (courtesy of Chris Kennedy). The earliest depiction of Moss Neck AAF which has been located was on the 1952 USGS topo map. 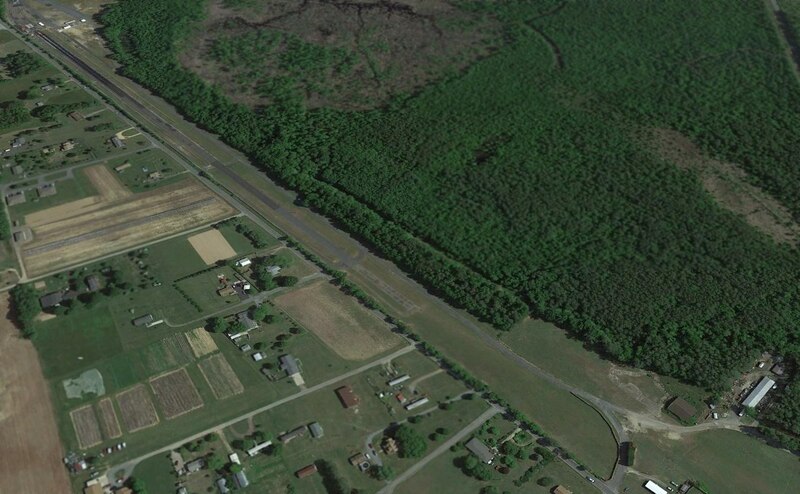 It depicted “Moss Neck Airstrip” as having 2 runways, with 2 small buildings northeast of the runway intersection. was on the January 1954 Washington Sectional Chart (courtesy of Chris Kennedy). It described the field as having a 1,700 hard surface runway. as it was not repeated by later charts. as having 2 unpaved runways: a 1,700' Runway 18/36 & a 1,550' Runway 12/30. but the field was described as unattended. 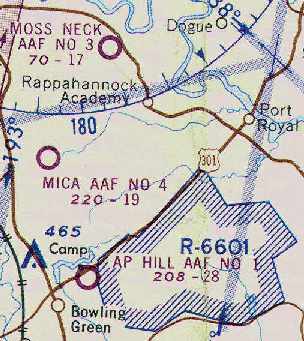 Moss Neck AAF #3 (and the other 3 Camp AP Hill Army Airfields), as depicted on the 1963 USGS topo map. 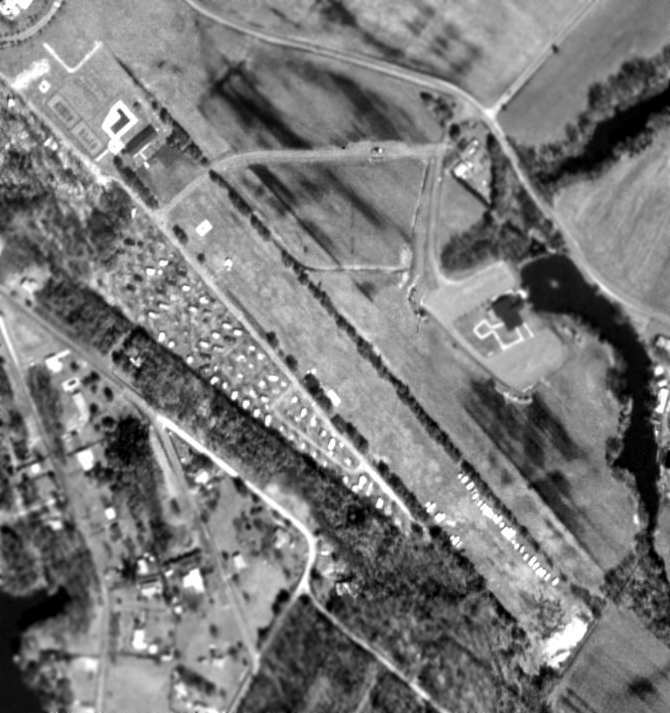 The earliest photo which has been located of Moss Neck AAF was a 1963 aerial view. It depicted Moss Neck as having 2 grass runways, with 2 small buildings northeast of the runway intersection. 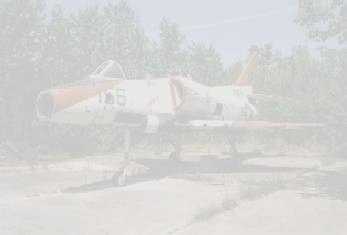 depicted "Moss Neck AAF #3" as having a 1,700' unpaved runway. but the small buildings on the northeast side appeared to have been removed at some point between 1963-66. A 1967 aerial photo depicted Moss Neck in an unchanged configuration. on the April 1969 Washington Sectional Chart (according to Chris Kennedy). which is how it was depicted on the March 1977 Washington Sectional Chart (courtesy of Chris Kennedy). The 2 runways were still depicted as "Moss Neck Landing Strip" on the 1984 USGS topo map. which depicted the 2 runways as the "Moss Neck Landing Strip". as it is no longer depicted at all on the March 1993 Washington Sectional Chart (courtesy of Carl Taylor). but there was no sign of any recent use of the airfield. 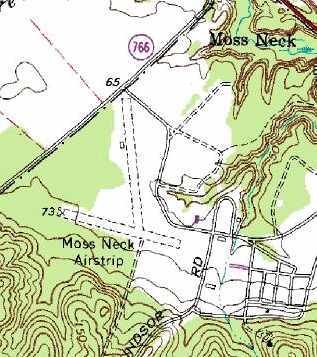 The 2001 USGS topo map continued to depict “Moss Neck Airstrip” as having 2 unpaved runways. at the very northern tip of he Fort A. P. Hill property. 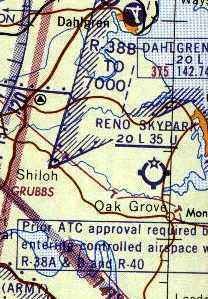 Reno Skypark, as depicted on the August 1957 Washington Sectional Chart (courtesy of Chris Kennedy). as it was not yet depicted on the January 1956 Washington Sectional Chart (according to Chris Kennedy). was in the 4/5/56 issue of the "Potomac Interest" newspaper (courtesy of Orville Ingram). The article read, “The new 'Reno Sky Port', an airfield for Colonial Beach, is now being used. The new airport, 3.5 miles from Colonial Beach, on land belonging to Walter Massey, was put in use last week. They have a runway one mile long, which will eventually enable any type plane to land on the field. A telephone will soon be installed so that any plane using the field can obtain transportation. Also aviation gasoline will be available & a hangar will be built. Work has already started on getting the runway in shape. Additionally work will be done in the near future to permit the full use of the field. One or more regularly scheduled airlines are interested in running 'Champaign Flights' to Colonial Beach. The new airfield is owned by Reno Pier. They have been interested in locating an airfield at Colonial Beach for some time." 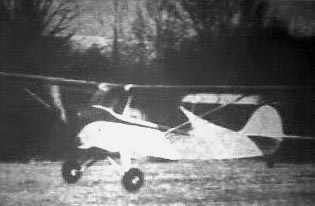 An undated photo (courtesy of Orville Ingram) of the 1st plane to land at Reno Skypark (an Aeronca?). It was flown from Richmond by Dennis Conner & Jimmy Dyson. with the runway extending toward the top-right (courtesy of Orville Ingram). An undated photo (courtesy of Orville Ingram) of a twin-engine 18-seat Boeing 247D, painted pink, charcoal gray, and beige. and was first used in the Fall of 1956 for "Champaign Flights" from Colonial Beach to Washington National Airport. Three of the 4 Conner brothers that ran the Reno Air Park were Denning, Delbert and Paul. “On Tuesday, July 24, a charter flight of 2 DC-3s will fly into Reno Airpark from Alexandria. They will be carrying more that 50 passengers between them. This marks the first commercial flights into Reno Skypark. After spending several hours at the Beach they will return to Alexandria late Tuesday night. was on the August 1957 Washington Sectional Chart (courtesy of Chris Kennedy). It depicted the field as having a 4,500' unpaved runway. An undated aerial view looking north at the Reno Skypark. It depicted the field as having a single 3,500' unpaved Runway 14/32, along with 875' & 1,000' overruns. Several buildings were depicted at the southeast end of the runway. was on the 1960 Washington Sectional Chart (courtesy of Mike Keefe). The Aerodromes table described the field as consisting of a single 3,500' turf runway. 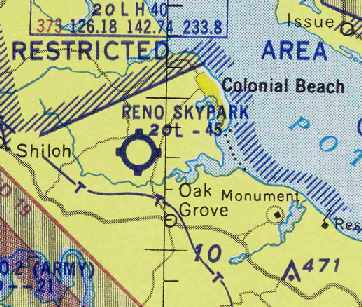 Reno Skypark was not depicted on the 1961 USGS topo map. as it was no longer depicted all on the 1964 Washington Sectional Chart. 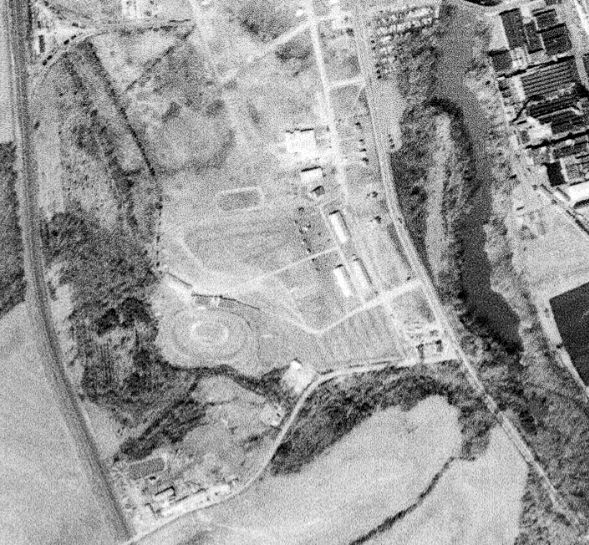 A 1967 aerial view depicted a dragstrip covering the former runway, along with a possible hangar at the southeast end. The 1971 USGS topo map labeled the site as “Colonial Beach Dragway”. Christopher Mallam reported in 2003, “I remember going to my Uncle's house in Colonial Beach about 20 years ago. Right across the road was an abandoned airport. A 2015 aerial view looking north at the Reno Skypark site showed the former runway, reused as a dragstrip. What appeared to be a former hangar was at the southeast corner of the photo. The site of Reno Skypark is located northwest of the intersection of Route 205 & State Highway 631. 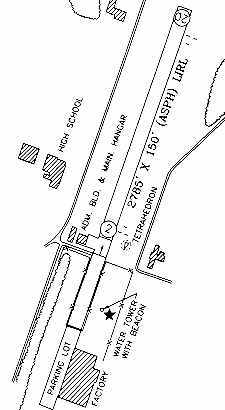 Harbor View Airport, as depicted on the 1970 Washington Sectional Chart (courtesy of John Clifford). 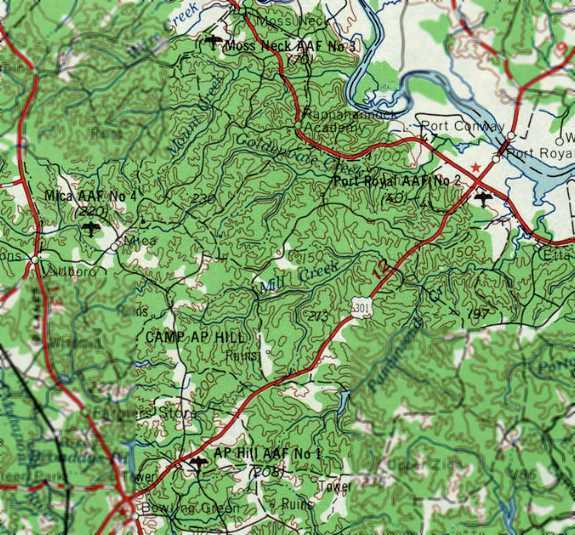 nor depicted on the 1963 USGS topo map. 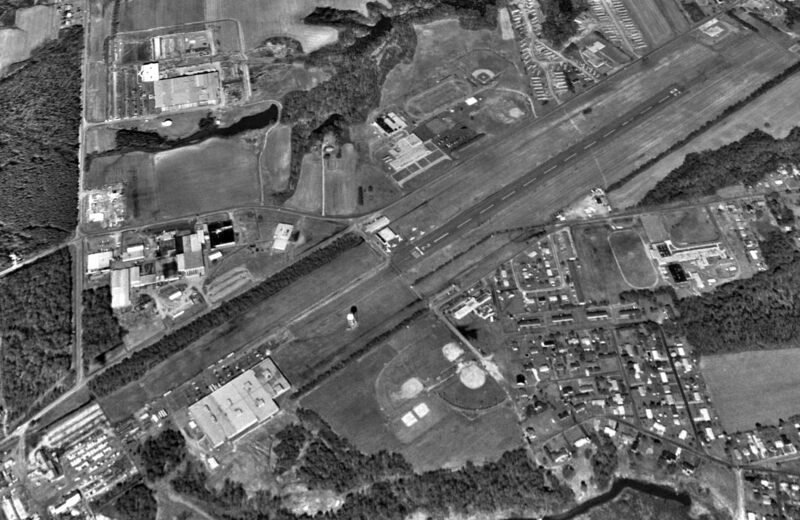 The earliest depiction of Harbor View Airport which has been located was on a 1967 aerial photo. It depicted the field as having a single northwest/southeast grass runway. was on the 1970 Washington Sectional Chart (courtesy of John Clifford). It described the field as having a 2,600' unpaved runway. described Harbor View Airport as having a single 2,600' turf Runway 15/33. It listed the operator as the Harbor View Yacht Club, and the manager was listed as Don Davis. 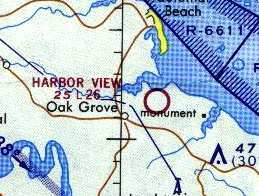 The 1971 USGS topo map depicted “Harbor View Airport” as having a single northwest/southeast runway. Merton Meade recalled, “Harbor View was a lovely wee strip. A June 15, 1973 aerial view by Kenneth Keeton looking northwest along Harbor View's Runway 33. 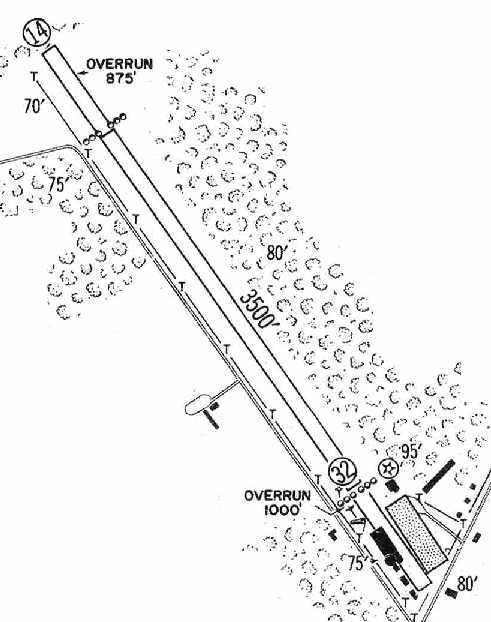 Harbor View Airport, as depicted on the 1975 Washington Sectional Chart (courtesy of Ed Drury). and described the field as unattended. Harbor View Airport was still listed as an active airfield in the 1979 Flight Guide (courtesy of Chris Kennedy). The 1985 USGS topo map depicted “Harbor View Airport” as having a single northwest/southeast runway. along with a large number of other objects (trailers?). A 10/25/13 aerial view looking northwest showed the runway at Harbor View to remain intact, but without any sign of recent aviation usage. The site of Harbor View Airport is located northwest of the intersection of Route 664 & Oak Lane.